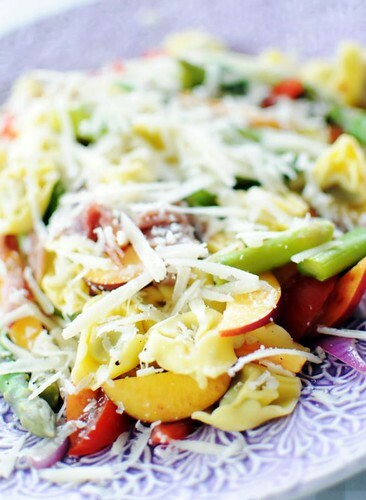 Quick summer lunch - perfect for hot days. It's fresh tortellini - this one was mushroom-filled. Asparagus, cooked for just a few minutes. Wedges of perfectly ripe nectarines. Red onions. Parmesan cheese. And a light drizzling of olive oil and white wine vinegar. Anne,we don't get nectarines so easily here,what fruit do you think I can substitute it with? I would say peaches make a reasonable substitute for nectarines, but I'm no professional! I have been trying to post this comment,but blogger has been unavailable.. Thank you Tora,I had been wondering,since as I said,we don't get nectarines here..:-) Thank you to Anne for a wonderful recipe as well! P.S. If you like Indian and Asian food,you might like to have a look/follow my blog too..
peaches are definitely a good alternative! Melon would be nice as well - maybe cantaloupe?